Optimists have always said, in essence, that there's nothing to worry about-that confidence in the dollar will never truly be shaken, no matter how high our national debt or how dysfunctional our government. But in the last few years, the risks have become too big to ignore. While Washington is gridlocked and unable to make progress on our long-term problems, our biggest economic competitors-China, Russia, and the oil producing nations of the Middle East-are doing everything possible to end U.S. monetary hegemony. The potential results: Financial warfare. Deflation. Hyperinflation. Market collapse. Chaos. The author shows how everyday citizens who save and invest have become guinea pigs in the central bankers' laboratory. The world's major financial players-national governments, big banks, multilateral institutions-will always muddle through by patching together new rules of the game. The real victims of the next crisis will be small investors who assumed that what worked for decades will keep working. Fortunately, it's not too late to prepare for the coming death of money. 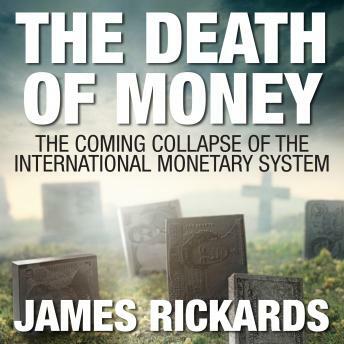 Rickards explains the power of converting unreliable money into real wealth: gold, land, fine art, and other long-term stores of value. As he writes: "The coming collapse of the dollar and the international monetary system is entirely foreseeable... Only nations and individuals who make provision today will survive the maelstrom to come." An eye opener book, great perspective of macro economics.